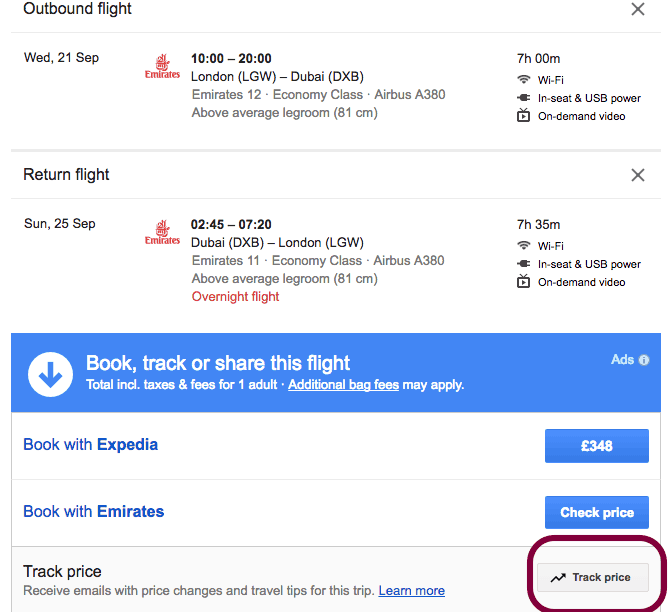 I have written about one of my favourite ways to check out the prices which is using Skyscanner. However what happens if you go to book a flight and it is expensive? One day you can find a flight for £350 and the next day when you are ready to book the price goes up to £500. You get scared that it will go even higher so you book. But then the following day the price is again lower at £400. You get frustrated and kick yourself for not waiting. I know, because this has happened to me on many occasions! Flight prices are so volatile that they can change within hours not days. If for example, you book during the weekend you are more likely to see the prices inflated. Personally, I have noticed that when I look for flights during the day they seem to be more expensive than during the night, like after11pm. Now, I am not sure if this has anything to do with actual pricing but one thing is sure I never book my flights on the first day I look. What I do is always to track the price for a few days until I have the right price for me. Now, you might be wondering how do you do that? 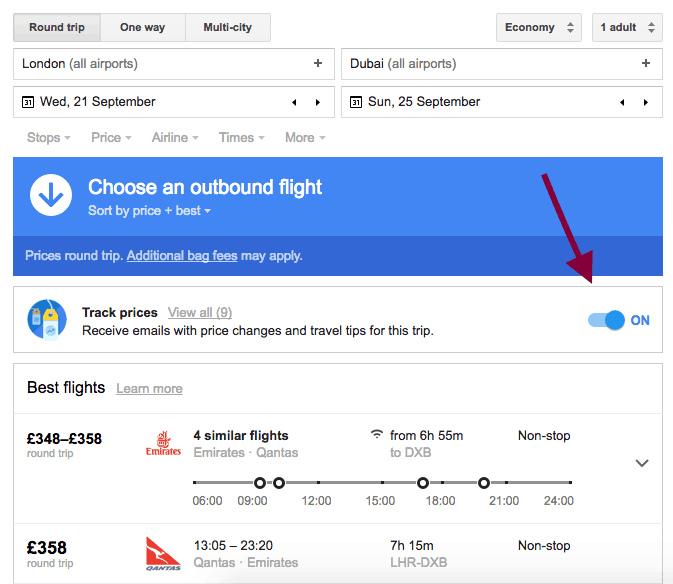 One of the easiest ways to track prices is using Google flights tracker. It is super easy and it will send you email alerts when the price changes. As a fun exercise I was tracking some flights for a client and believe it or not the pricing was crazy. It started at £700 and it went up to £1100 just in a matter of days. Imagine if I had decided to book the £1100 flight on the day I saw it. My client would have overpaid £400 per person. Definitely not a cool thing! That money is enough for 6 nights in a 4-star hotel. I much prefer spending it there than the airline. Here are three flights I was tracking. Go to google flights and find the flight you want. Select your flights / times and at the end of the process track price option will appear. Click there to track the prices. Always track the prices of your flight for a few days. See a pattern and when you find the price you are happy with, book it. Sadly there is no right or wrong way to know if it will go up or down, but monitoring will help you see a pattern. After tracking them for a few days you can make up your mind if you want to buy or still wait. You can even track a dream trip you want and monitor the prices over months to see what is the lowest price for your flights. I love Google even more for this option since it can help you gain an understanding of prices, especially on routes that you might use more than once. 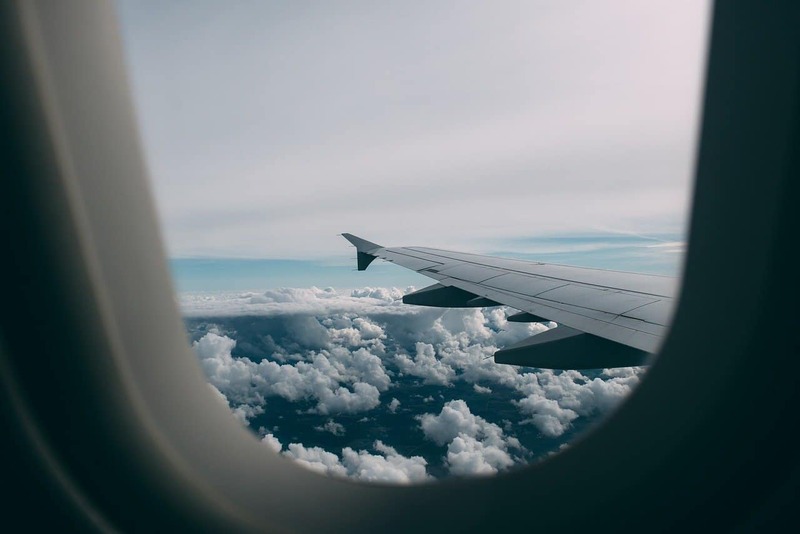 I agree completely,I have been able to save at least one hundred dollars per flight by simply tracking a desired flight as soon as two months prior to departure. The email alerts are very useful, and I find bigger savings for domestic flights, (Canada). Great tip! I love your tips Elena! Thanks for that, I’ll use it next time.